"I tried not to sound hysterical, but it’s not every day you find out the paranormal is hunting you." Seventeen year old Allison Maney attends Millennium High School in Manhattan. Nothing out of the ordinary, unless you consider the occasional suicides at the school. At least that is what everyone is told, what everyone believes. But Tommy Bachelor was a popular football player; why would he jump off the roof of the school? When Dameon pays attention to Ali, she couldn't be more excited, because for the past three months he was all she could think about. But now that Dameon is finally pining for her affections, she is becoming more and more wrapped up in a clique of three who, as new transfers to the school, are proving to be trouble. But at least Dameon loves her, doesn't he? Kian- a dangerous love interest she did not ask for. Powers- belonging to an underworld she never knew existed. A Clique- that could be friends or foes? The underworld of angels and demons have one thing on their mind: Earth. Demons want to do what they want. Ali won't know who to trust…or who to love. I fidgeted with my galoshes until I finally curled one leg under the other. “Tommy died for a reason. Doesn’t that reason bother you?” A gust of wind blew past and tousled my hair. “How would we ever know the reasons? We can’t read his mind,” Molly retorted as she fixed her favorite avocado-colored scarf, which draped on her neck, a scarf that accented the green in her irises. Sniffling, Jennifer desperately wanted to join the conversation, but couldn’t speak without shaking and bawling. She tended to her wool mittens instead. Red-eyed and disheveled, she reminded me of an old rag doll. Dressed in heavy beige coats, knit hats and boots, the three of us stayed relatively warm in the 30 degree weather. We were well acclimated, since we were all born and raised in New City. “There has to be something we can find. He was popular for heaven’s sake, ” I insisted as Molly stared at me incredulously. “Girls loved him. Teachers adored him. Doesn’t make any sense.” I shook my head. “Why? His best friends don’t even know why. Why does anyone do it?” Molly plopped her hand down on the picnic table, the hand holding the fanning paint brush. Dabbing her ocean blue canvas with specs of white, she created a snowy effect. “Maybe he just couldn’t take the pressure of being popular anymore.” When she rolled her eyes, I knew what Molly was thinking. She didn’t like the so-called jocks. Suicide or not, she didn’t want to give them any more of her time. But I didn’t want to let it go, couldn’t let it go. Something about it nagged me. Brilliant! I hadn’t even thought of it, but I did have journalism fifth period. I could satiate my persistent curiosity and complete an assignment all in one. Every writer needed a muse and Tommy would be mine. A muse from the grave. “We could work on it together...like Bonnie and Clyde.” I grinned as a snowflake dropped from the pines above and lit my long lashes. Tightening the hug-grip around her chest, Jennifer sniffed one last time before raising her gaze. “Why not? Could be intriguing. Today is Wednesday and we don’t have to be back at school until Monday. What else are we going to do?” I rationalized. “I’ll do it.” Jennifer interrupted, the sound of her voice almost foreign at this point in the conversation. We both jerked our heads in her direction. Wiping her nose with the back of her coat sleeve she held a sneeze and repeated more firmly. “I’ll do it.” Her big brown eyes widened as her lips tensed. “Something is going on at this school and I’ll be damned if I’m just going to sit and do nothing.” Jennifer got her mojo back, a newfound task of investigation motivating her out of her misery. Jennifer and I both turned at the same time and grinned. “What else am I going to do until Monday without the two of you?” Molly reasoned. “It’s settled then. We are officially the unofficial team investigating this suicide,” I added as another gust of wind brushed through the park, rushing over Molly and Jennifer. 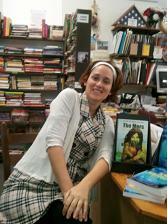 About the author: Ami Blackwelder is a romance suspense writer in the paranormal, scifi and historical genres. Growing up in Florida, she graduated UCF and in 1997 received her BA in English and additional teaching credentials. Then she packed her bags and travelled overseas to teach in Thailand, Nepal, Tibet, China and Korea. Thailand is considered her second home now. She has always loved writing and wrote poems and short stores since childhood; however, her novels began when she was in Thailand. 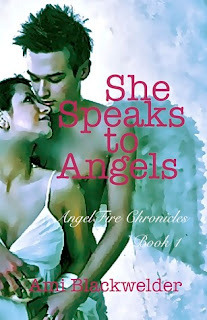 One reader who comments below will win an ebook copy of She Talks to Angels. Contest ends on midnight on May 14. Leave your email address for contact. I love the covers, they are so unique and refreshing because they look like beautiful paintings instead of just a picture! The excerpt was great and I love books with angels!